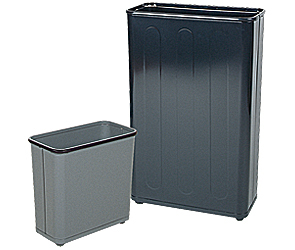 Traditional steel wastebaskets featuring a vinyl top bumper to protect against walls and steel legs with nylon button pads to protect floors. These waste receptacles meet federal specification A-A-182 for fire hazard and flammability prevention. The durable powder-coated puncture-resistant fire-safe steel will not burn, melt or emit toxic fumes and the raised bottom prevents heat transfer to floors in case of fire. The 7.5 gallon WB30R model is UL classified fire safe.